There are at least two bands named Ever. 1. There are bands who wish they could, and then there are bands that do. Ever is a band that does. But not only is Ever a band that does, they are doing everything on their own engine. Without the aid of a record label, they have made industrious strides independently. Ever has seized the DIY aesthetic and credo, and turned their music into much more than a hobby. 1. There are bands who wish they could, and then there are bands that do. Ever is a band that does. But not only is Ever a band that does, they are doing everything on their own engine. Without the aid of a record label, they have made industrious strides independently. Ever has seized the DIY aesthetic and credo, and turned their music into much more than a hobby. In a small amount of time, Ever has made an indelible impression on fans of synthpop, goth, electronic and industrial music. 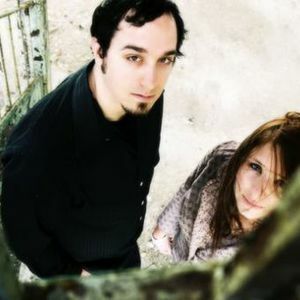 Their self-titled debut from last fall has already sold over 1100 copies online, mp3s have been downloaded more than 10,000 times, and 4,000 visitors have streamed their songs from websites like Myspace.com. Their continued presence in cyberspace includes six VH1 radio stations, about a dozen other online radio stations, If the quantities are not impressive on their own, consider the art of Ever. Ever's music is a symbiosis of mind, spirit, art and sound. Without coming across as pretentious, one senses the earnest desire of Ever to create music that is otherworldly. Michelle Averna's towering and beautiful vocals are shrouded in the aural landscapes of husband Jesse Averna electronic gadgetry. Within this framework are delicate piano notes, ambitious electro-textures, and elegantly evocative songs that absorb into your heart, the way water seeps into cell walls by osmosis. "Our music has a definite message and driving force behind it. The music creates a backdrop for the real heart of the song, the message. Ever has not had the bounds of normal electronic music. I am not trying to make songs that simply make you hum along, but music that will connect with the audience and haunt them for days." Attending a short stint of college in Missouri, Jesse Averna one day felt the tugging in his soul to stop his studies and pursue his dreams. "Music was in my heart; it was a culture for me. I have always been involved with video production: creating mini movies, post production, etc. but I never really had a chance to delve into my heart for music. After dropping out of school, I packed up my things, moved home and bought a keyboard. Joey Belville [The Echoing Green] and I were becoming the best of friends and he helped me choose the right equipment and even showed me how to use it." Because of his background and continued interest in film, and video, Jesse likens making music to making films. It goes beyond just capturing a good hook for Michelle and him. He makes music that he can be interested in himself. "Ever is really music I always wanted to hear. Music creation on a computer is very similar to video editing. So, the way I make music is in a very visual way. I consider myself more of an orchestrator or director, than a musician. He details their sound as something unbound and mysterious. "It is dark, sobering, delicate, organic meets machine." One might think he's being facetious when he likens Ever to a hybrid of Enya and Nine Inch Nails, but with one listen it becomes clear that there are even elements of those two seemingly disparate artists within the music of Ever. Beyond that, even the influences of such diverse artists as Danny Elfman, The Birthday Massacre, and Vince Gueraldi make some indentations in their compositions. After moving to San Francisco from their hometown in Albuquerque, Jesse was struggling with recovering from a grueling back-injury. Taking advantage of that time, also gave him the impetus to create music for the first time. "This was my first real opportunity to get Ever going, and give music a chance. I was in great pain, but it became one of the best things that have ever happened to me." Ever's relationship with Joey Belville has been invaluable; not only did he function as a mentor as Jesse acquired the appropriate gear, but took the helm in producing the album. Belville's own career as the frontman and songwriter for The Echoing Green lent the right touch of expertise, and experience to Ever's freshman project. Their strong presence on the internet has allowed them a following that is largely overseas. "Our audience is really based online. We have a big fan base in Canada, Germany, and the UK. I'd say over 50% of our audience is overseas. That being said, though, we have also had limited means of getting our music heard in general." However, one of the advantages of having established themselves independently means they are already poised to move multilaterally into mainstream audiences, with the support of their current listeners. 2. Ever is a melodic death metal solo project from the Isle of Lewis, Scotland, formed in 2006 by Donald Alasdair Morrison. All albums and E.P.s are independent internet releases and are available for free download. A full-length album entitled A Fake Blue Sea was mostly written throughout the final months of 2007 and the first half of 2008, and was completed in the summer of 2009. A single-track E.P. entitled Flesh was written and recorded in January 2010. A three-track E.P. called Sunrise was completed in July 2010, having been written almost a year earlier. In November 2010 a two-track E.P. called November Nights was recorded, featuring synthesised piano versions of the songs A Fake Blue Sea and These Four Walls And I Alone which originally appeared on the album A Fake Blue Sea.